Here we are playing Dreamcrushers Inc. at Red 7 back on January 31st, 2013. Thanks for the video DIY Danna Vision! Hey Martian Maniacs, we wanted to let you know we are still rockin. 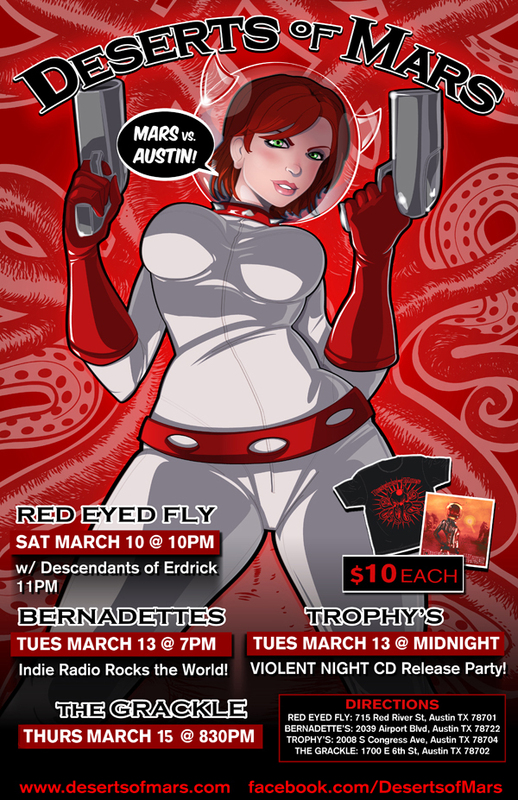 We’ve been playing gigs around Austin and out of town but we’re heading back to Red Eyed Fly on Feb. 16th to celebrate Tony and Space Viking Erik’s respective birthdays (before and after the 16th) it is going to RAGE!! We’ll have more details very soon! We’re also building on our Martian empire with new tunes in the works as well as mapping our plan to dominate the Earth starting with Texas. As we travel outside of Austin and beyond the galaxy, be sure to check here as well as our more immediate feeds Deserts of Mars Facebook page and on Twitter. Tell your friends across the Universe!!! You’ll never miss an event if you follow us there! Since Billy left to teach his daughter how to fight Rocktopi, we had to wait for the Curiosity Rover to do it’s real mission and find us a drummer. We’ve found the mighty Space Viking Erik Kinservik who thundered his way to our Martian home base and is now rocking the drums in DoM. 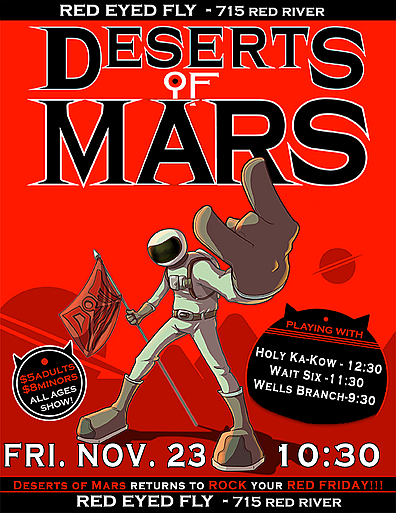 Deserts of Mars returns from their home base with a new drummer and more rock than ever! Forget Black Friday… We’re turning it to the new post holiday: RED FRIDAY! 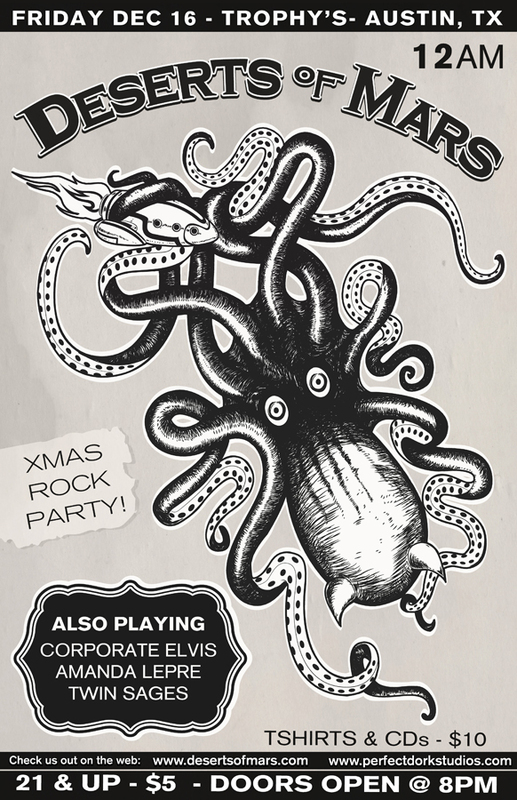 As usual get there directly on time and stick around for an awesome night of ROCK. Our friends Holy Ka-Kow rock the headlining slot and we are surrounded by new friends Wait Six and Wells Branch. Roll out of bed in the afternoon and start your weekend with a healthy dose of ROCK! It’s also Megan of Holy Ka-Kow’s B-day! Come early and stay late for awesomeness!! We will also be announcing new 2012 closeout and upcoming 2013 shows very soon! We’re also working on a new and improved DoM website that allows us easier updating and more ROCK for everyone. Hope to see you all more often. In the meantime, there’s always the Deserts of Mars Facebook page. Tell your friends across the Universe!!! We’re playing four shows during SXSW so you will have ample opportunity rock out with us. Saturday the 10th at Red Eyed Fly at 10:00, Two shows on Tues. the 12th, first at 7:00 at Bernadette’s for the Indie Radio Rocks the World 2 show then at Midnight at Trophy’s for the Violent Night CD Release Party and finally at The Grackle on Thurs. at 8:30 for the AFHC Grackle Rock II super rock show!!! All of these shows are FREE except for the Saturday Red Eyed Fly show. TONS of awesome bands are at each one, so come out and rock with us. For updates and more info always check the Deserts of Mars Facebook page. We’ll be updating throughout the week. Headlining Trophy’s on Friday Dec. 16th! $5/21+. Doors open at 8:00, and live music starts at 9:00. We’ll have T-shirts and CDS if you want to give the gift of ROCK this holiday season and we might even have some extra giveaways. We won’t judge if you’re naughty or nice, as long as you come have a good time.